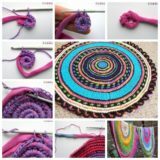 Exciting and Colorful: Great Crafts Made With Paint Swatches! 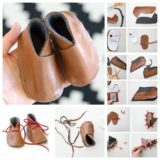 When it comes to crafting and getting creative with new materials, we’re open to trying pretty much anything! 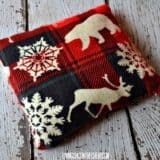 Part of why we love the world of DIY so much is that you really can transform just about anything into something exciting, new, and even more useful than it was before. 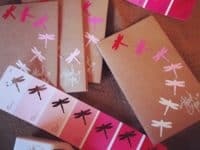 The way we just gathered up all the old paint swatches from when we were planning out our kitchen renovation and turned them into several different awesome homemade projects is the perfect example of what we mean! 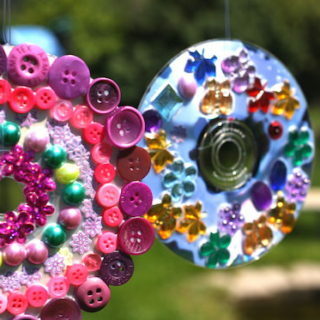 The added bonus of this particular upcycling craft is that, no matter what you make, it’s guaranteed to be brightly coloured. 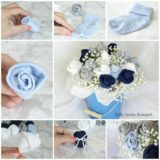 Have you always been the kind of crafter who believes you can make flowers out of literally anything? 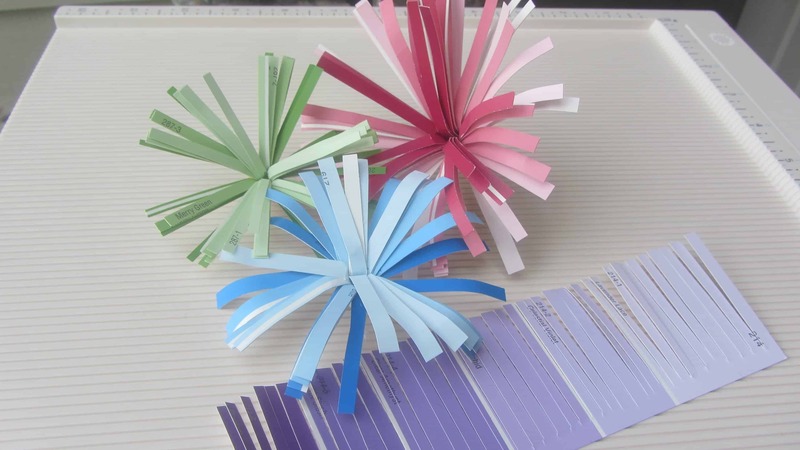 Then here’s one more idea for you to try your hand at, just for another style in your exciting, eclectic DIY bouquet. 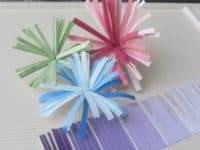 Take a look at how Margaret Meyer transformed full shade strips into awesome fringed flowers in just a few surprisingly simple steps. 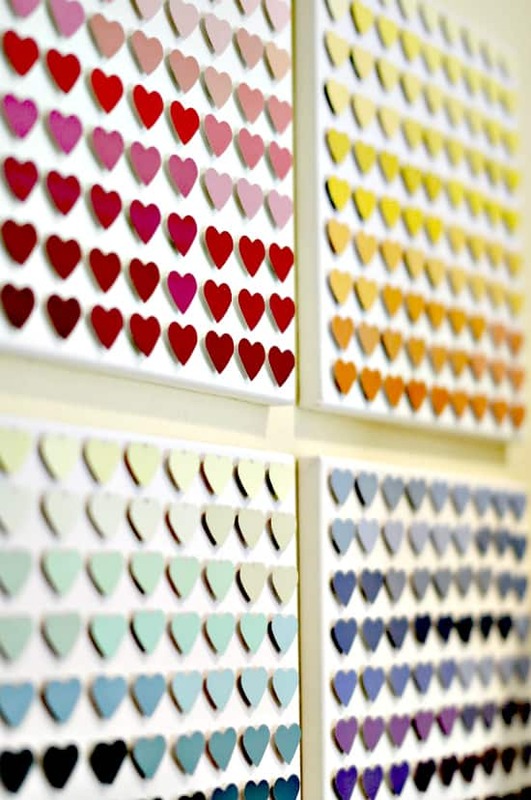 Are you a huge fan of the wonderfully saturated colour that different shades of paint swatches have but you’d rather cut them into different shapes than just working with the squares or the strips that you got them in originally? 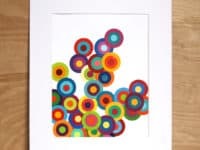 In that case, we have a feeling you’ll really appreciate the way The 3 R’s created awesome framed art by layering differently sized circles on top of each other to look almost like rainbow paint drops. 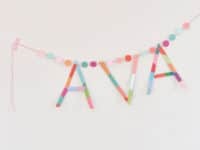 We’re not quite sure that we could ever pinpoint why, but we’ve always just absolutely loved buntings and garlands. 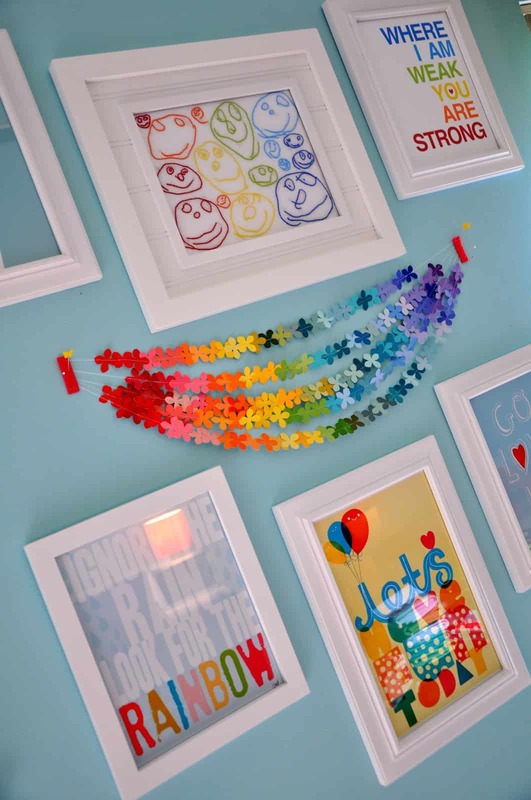 Whether you’re hanging them for a party or just decorating your space with them because they’re fun, we adore finding new ways to make them from all kinds of things. 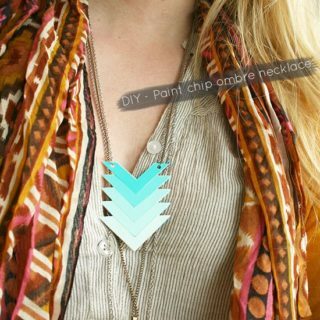 It’ll come as no surprise to you, then, that we made sure to find a way to make a cute garland from paint swatches too! 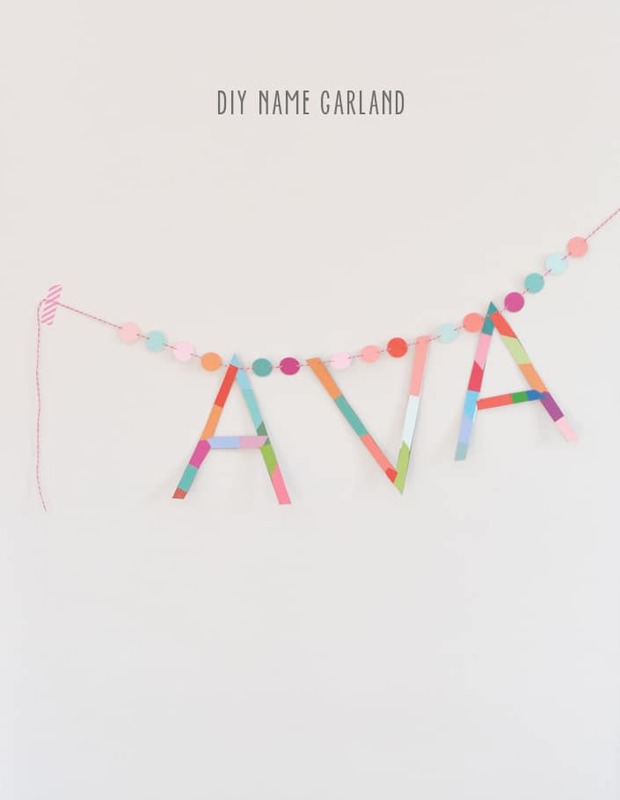 Art Bar shows you how to cut and paste together a name and hang it up on a string for a cute, colourful personalization of your room. 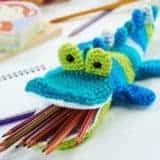 Perhaps you have little kids who adore all kinds of crafts, but who are particularly enthusiastic about simple cut and paste ideas since they’re simple, something they can do on their own, and something they can make pretty much anything with? 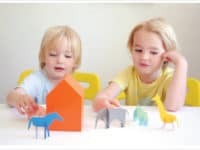 Then we have a feeling your family will get along very well with these paint swatch animals outlined step by step on Mermag. 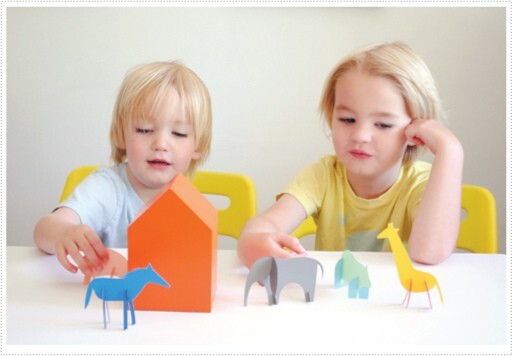 They show you how to make the colourful animals stand by using the thicket texture of the swatch cards to your advantage. 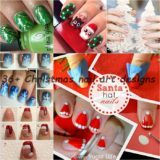 In addition to making your family and friends gifts whenever you can, are you although the kind of thorough DIY gift giver who quite enjoys making the package and gift wrapping you put those things in as well? 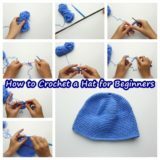 Then we’ve definitely found a tutorial that we think you’ll get a lot of use out of! 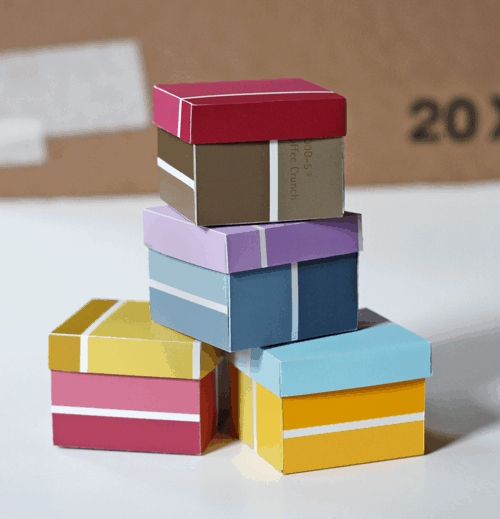 Check out How About Orange to take a closer look at how these adorably colourful paint swatch gift boxes were made. 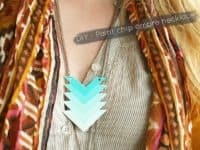 As weird as it sounds, we’ve actually always loved the full ombre effect featured in paint chips and swatch cards so much that we’ve frequently wished we could wear them. 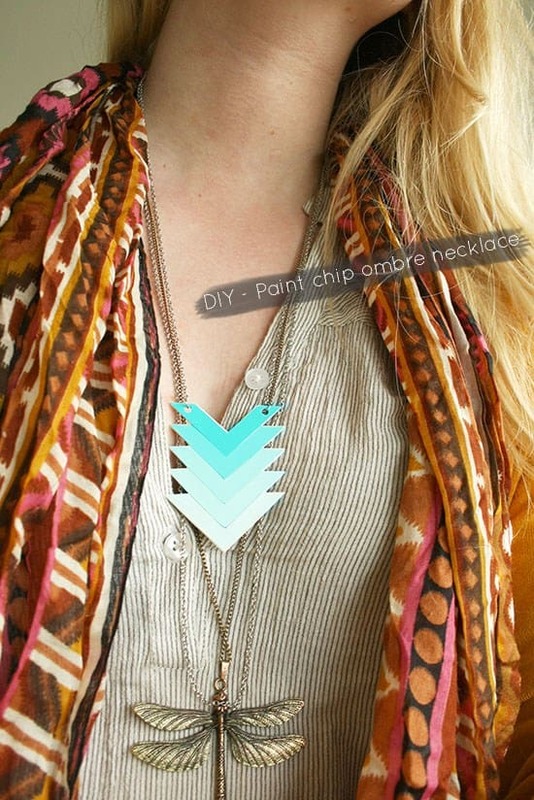 Imagine how excited we were, then, when we stumbled upon this fantastic DIY necklace idea that actually lets you do just that! 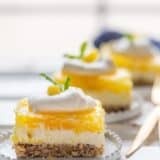 By Wilma shows you how they made theirs with a lovely overlapping arrow shaped design. 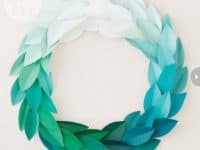 Are you definitely feeling the most intrigued by all the ombre and colour gradient ideas you’re seeing on this list, but you’re still kind of a classic crafter who would rather make a DIY home decor piece that’s a little more traditional? 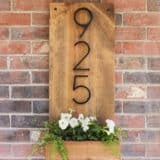 Then maybe a wall or door wreath would be a little more up your alley. 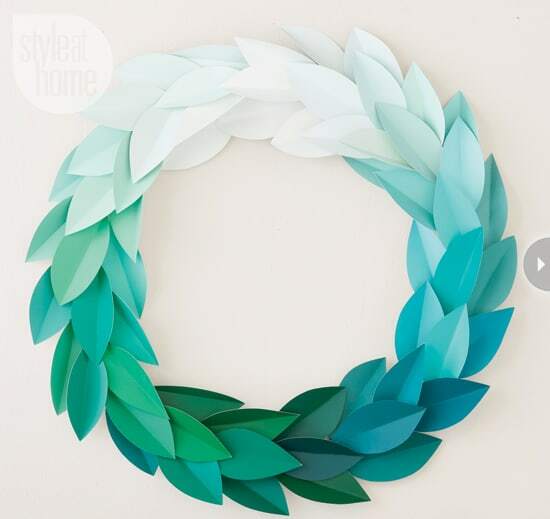 We love the way Style At Home used teal and green colour gradients in a leaf shape to create a lovely gradient effect, but you could recreate this same design in all kinds of colours and still make something that looks absolutely beautiful, even if leaves are not usually pink or purple! 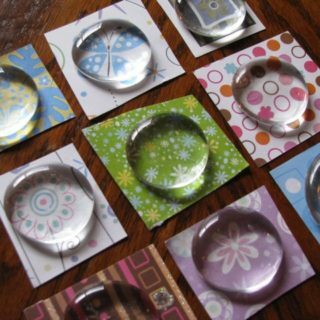 Perhaps you’re not really interested in upcycling your old paint swatch cards in a way that overtly repurposes them as a whole, but you just can’t make yourself throw out such good card stock in nice, bright colours? 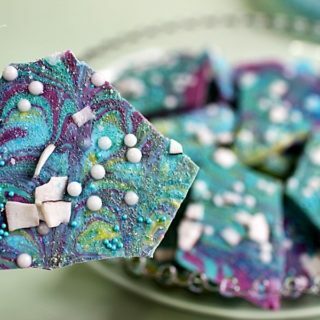 Then perhaps you can use them as hole punch ombre kits, kind of like Everyday Cookies did here on their beautifully embellished thank you note envelopes! 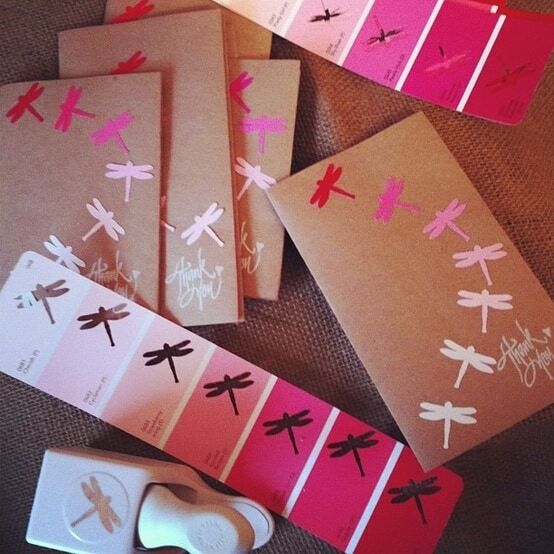 No matter what you stick them to or what shape you punch out, you’ll get a lovely colour way effect. 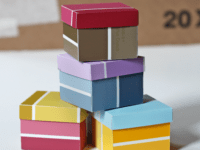 Are you actually so fond of the idea of making brightly coloured little card cut outs from your paint swatches but you’d rather create something a little more decorative and a little less temporary than what we showed you above? 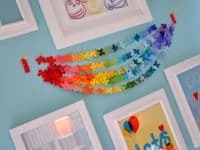 Well, if you’re also a fan of the party garland idea we were talking about earlier, then we think perhaps these super cheerful butterfly bunting strings outlined from start to finish on Little Bit Funky might be the best choice for you! 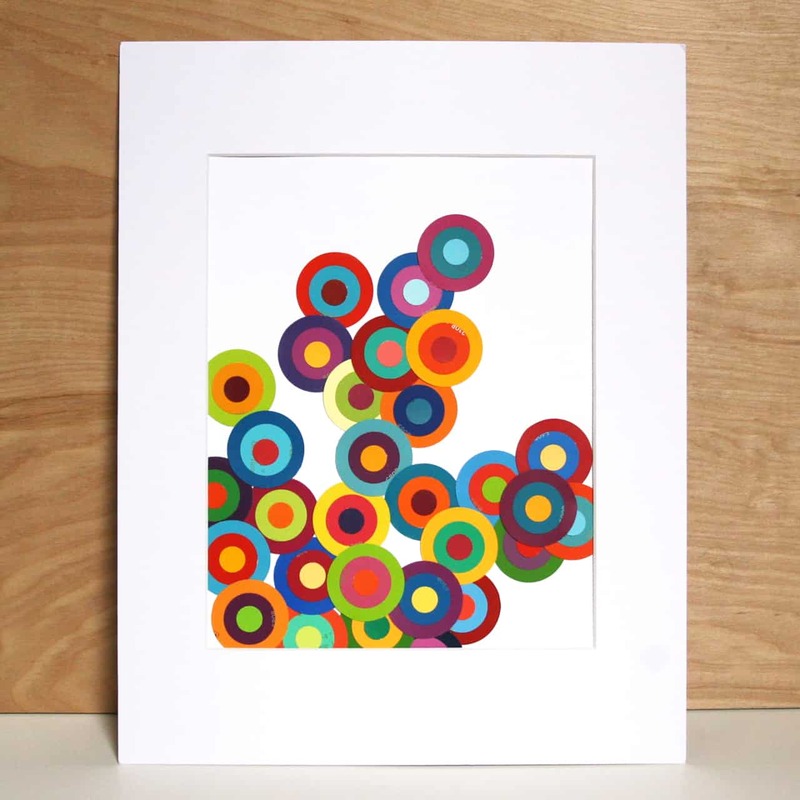 If you’re going to harness the beauty of one lovely colour way by repurposing paint swatches, would you rather go all out and gather a whole bunch of full gradients and turn them into hole punch art? 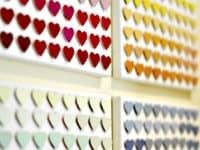 In that case, we’d definitely suggest taking a look at how I Heart Organizing did just that by cutting out whole ombra series’ of hearts and sticking them in colourful rows across several canvases. 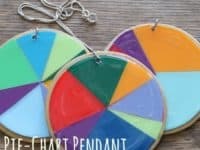 If you’re going to paint paint swatch jewelry, would you rather do it in a way that’s a little more unique or kitschy, possibly even enough to make people ask you about it? 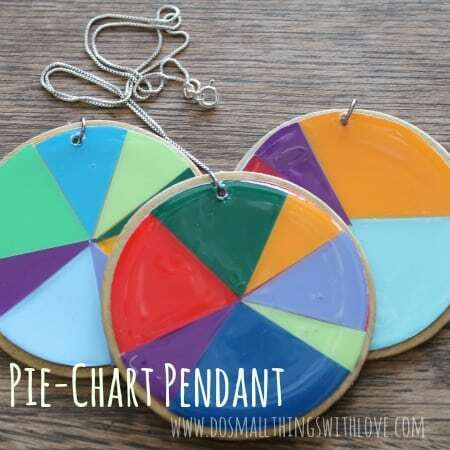 In that case, we’d absolutely suggest taking a look at how Do Small Things With Love made these funny pie chart inspired necklaces by covering differently sized and and coloured slices of paint swatch cards in clear resin. 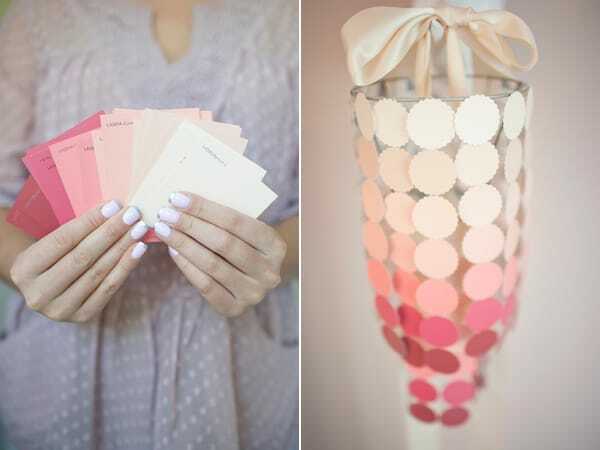 Did you perhaps really enjoy the basic concept of the paint lampshade idea that we showed you a little earlier on our list but your personal style and decor taste are slightly more flouncy and girly than what you saw there? 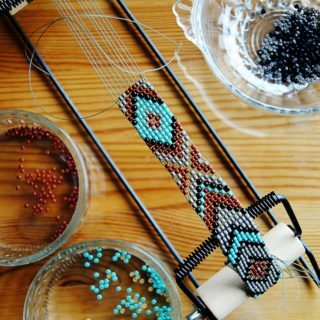 Then we have a feeling you might get along a little better with this stunning paint swatch chandelier cover idea outlined on Rhiannon Bosse instead! 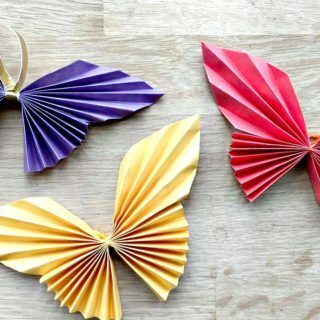 Cover a pendant light with it to make it into an actual chandelier or hang it like a mobile, as-is, to let people just appreciate how beautiful paper can be when it’s arranged with some ribbon in a chandelier style.